Many moons ago, when I started into action pistol shooting, the Para Ordnance P14 was the choice of many shooters. It was a double stack 1911 that held up to sixteen rounds of 45ACP, fit in standard 1911 leather, and most parts from John Browning’s original design fit it. Then the polymer craze hit the world of run-and-gun and Para fell out of favor, somewhat. A couple years back at the SHOT Show, numerous people were again gathering at Para Ordnance’s booth. What was all the buzz? This time out it was a double action only, P14. Let’s see, a 1911 with a smooth, light trigger pull compared to other DAO’s, and what more could the world of law enforcement and stock service shooters in IDPA ask for? Overall this was a great pistol, and the LDA P14 sold well. Those of us that are diehard single stack 1911 shooters only wanted to know one thing, where was a single stack? Well that question was answered in mid to late 2001 with the LDA 7.45, and at the ’02 version of the SHOT Show several versions of it appeared. This was way too cool, a true DAO 1911 that had a heritage of duty use and competition wins. That left this humble correspondent with one question: when can I play with one? Thanks to Kerby Smith, come mid-April there was a LDA 7.45 waiting for me at my shop. Like a kid on Christmas Day I tore open the packaging and was thrilled. Lo and behold, this LDA was the LE version with the bobbed hammer (to allow standard 1911 leather to fit) and night sights. This was great, and I even had a supply of .45 ammo in my trusty SUV, so it was off to the range. After a few quick rounds to check the trigger, it was time to shoot. Like other Para’s I have owned and shot, the LDA 7.45 ran like a champ. On the initial outing there was no real accuracy work done; just a shakedown cruise and I was not disappointed. It shot and shot. Ammunition from Cor-Bon, Winchester, PMC, International Cartridge, Remington, Triton and several reloads were shot. They all ran and shot to point of aim. Not bad for right out of the box. When we took the LDA 7.45 out for another session, it was time to see just how well this beast could shoot. Again we shot ammo from the previously mentioned manufacturers and we added Federal since I have found the 185gr. HiShok to be a superbly accurate loading. The LDA 7.45 did not let me down, and it easily shot sub-three inch, nine round groups at twenty meters off hand. Not bad for a double action only handgun. I thought the LDA 7.45 was such a fine pistol that I sent it off to Novak’s to have them do a modest bit of work on it; this was a keeper. Being a no frills, KISS kinda’ guy, I kept it simple: Novak Night Sights, a bevel/carry job, install an arched S&A Magwell for my blindingly fast reloads, install a tactical safety – in this case an Ed Brown – and refinish the beast as needed. For a carry/competition pistol, these are options that fit my, and for that matter, many shooters needs. The bevel/carry job was a must since Para Ordnance’s have many sharp edges that can leave their mark when clearing malfunctions and on clothes. 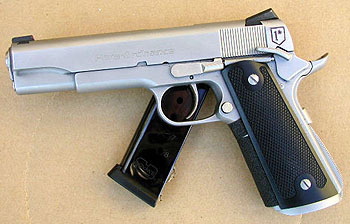 Of course, Novak’s can add many other options to your Para LDA or any number of other handguns. 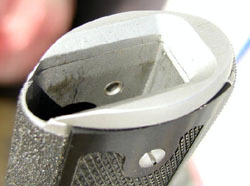 The S&A mag well is so well blended that the seam can not be felt and it is barely visible. The Para factory grip safety was re-contoured to remove all the sharp edges at the speed bump and the extreme tip that can catch on clothes. Dustin installed the Novak Sights so that they flow into the slide and just appear to be an extension it. Properly fitting and reshaping the tactical ambi-safety was done tastefully, and looks like they were made on the LDA. Other than the Novak sights, the most important item, at least to me, was the bevel/carry job that was done. There was not a sharp edge to be found, not even at the top right corner of the hood; which when clearing a stovepipe can be a painful experience. To enhance the LDA’s function, the barrel was re-crowned, a bushing fitted finger tight, and a reliability job was done: tune extractor, polish feed ramp, polish face of the slide. Performance wise, the LDA ran like a champ. The average group size dropped to around 2.5” offhand at 20 meters for nine rounds, which is more than adequate, provided the pistol always goes bang. This kind of accuracy will keep them all in the A zone of an IPSC or the “0” ring IDPA target, and in the worst case scenario, all in the thoracic cavity of someone bent on hurting you. Follow-up shots, thanks to the sharp sight picture of Novak sights, were quick and accurate. Thanks to the bevel-carry package, the pistol is smooth in and out of the holster, be it Kydex or leather. Clearing jams was not painful, and outerwear flowed off the LDA when concealed – all strong points of a fine tool. The final touches of my Novak LDA was to add some skateboard/anti-skid tape in place of checkering and a set of Aluma-Grips. The anti-skid tape is inexpensive and I was trying to keep the cost of my custom LDA down. Anti-skid tape is also replaceable when my Army Regiment ring (75th Inf. Ranger) tears it up, and its black. 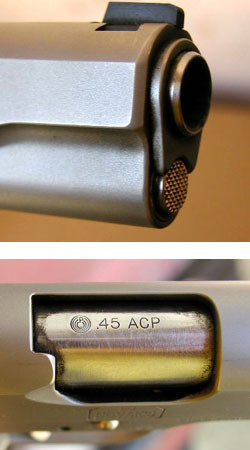 The Aluma Grips came engraved with the IDPA logo and they too are black. Because the grips are made of aluminum they will give a degree of protection should you have a case failure. They also have sharp edges to aid in gripping the LDA under bad conditions, be it from rain, sweat, snow, or while wearing gloves. Overall the Novak LDA is a fine tool. It shoots and looks good, and it did not break the bank, and this keeps the Smith financial manager (read my wife) happy. 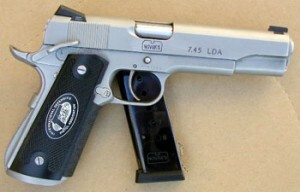 The total of the work done at Novak’s was less than $700 including return shipping, and the pistol was around $600 for the LE version of the LDA 7.45. You can run up a larger tab, or less of one depending on your tastes. For that matter, if you or a shooting bud holds an FFL, overall cost will be less. Anyway you cut it, the LDA is a must have kinda’ pistol.